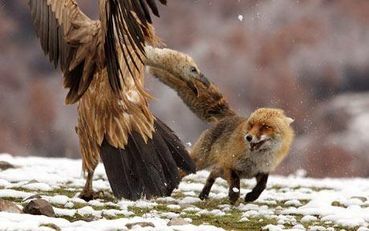 A vulture was forced on to the defensive when a fox attacked it as it fed on a carcass in a scene captured by a photographer in Bulgaria. What a picture,clever fox too! Thanks so much for this one Cher! Outstanding photo and outstanding article, totally loved this one! nature as it is meant to be seen ! thanks Cher . Where are the rest of the pics? This is so interesting. thank you Cher.